£100 deposit, full payment 6 weeks before hire start date, £100 security deposit. Full Terms & Conditions provided on enquiry. Weekly booking (Saturday - Saturday) preferred, but if you require another period, e.g.3, 4 or 5 days, please email me for a price. 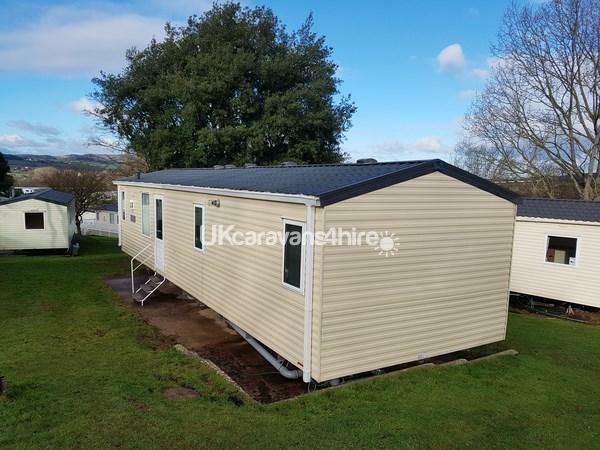 Welcome to our lovely 2 bedroom, 2 WC, 6 Berth static caravan holiday home situated on Golden Sands Holiday Park, tastefully furnished and equipped with all the comforts of home, including double glazing and central heating throughout. The comfortable Master Bedroom with KING Size bed has plenty of storage & wardrobes and en-suite toilet & wash basin. The second bedroom has twin beds with wardrobe and shelving. The family shower room, with toilet & wash basin completes the accommodation. Travel cot and High Chair provided on request. All bedding (other than cot bedding) is provided and beds made up for your arrival, however you will need to bring your own towels. Additional Info: Use of Golden Sands Park & Dawlish Sands Park facilities, including the Entertainment Clubhouse, Heated Indoor & Outdoor Swimming Pools, Free WiFi in the Clubhouse, Launderette, Shops etc. (Entertainment Passes are required, purchase from Golden Sands Reception, park facilities are available March - October). Wifi in the Caravan can be purchased through the park.In a short walking distance is the Blue Flag Sandy Beach of Dawlish Warren, with its long Beach & Sand Dunes and Dawlish Warren 18 hole Links Golf Course. The amusement area has go-carts, dodgems, selection of food, drink, beach accessories shops etc. Close by, there are a number of restaurants and pubs, including The Mount Pleasant with its views of the beach and Estuary, takeaways, cafes, convenience shops and Sainsbury’s Supermarket.